ISTANBUL, Turkey (June 5) – The Georgian duo of Zviadi PATARIDZE (GEO) and Nugzari TSURTSUMIA (GEO) stopped the host nation Turkey from grabbing a gold medal on the second day of Greco-Roman wrestling at the 2018 U23 European Championships. Georgia’s first gold medalist Nugzari Tsurtsumia scored eleven unanswered points to secure the 11-8 come-from-behind victory over Turkey’s Ekrem OZTURK in the 55kg gold-medal bout. The Georgian wrestler nearly conceded the technical superiority victory after surrendering a takedown and three left-sided gut wrenches, but obtained an exposure of his own, bringing the score to 8-2. Tsurtsumia ended the first period with a four-point throw off a re-drag, closing Ozturk’s lead to two points heading into the second period. In the final period, the 2015 junior world runner-up scored five additional points from a step out and another four-point throw, ending the 55kg finals match on an 11-0 run. At 130kg, Zviadi Pataridze, the five-time age-level world champion, and last year’s U23 world runner-up locked up two passivity points to win the rematch from the 2016 Junior World Championship gold-medal bout against Turkey’s defending U23 European champion, Osman YILDIRIM. Azerbaijan, Denmark, and Romania also captured gold medals on the second day of competition at the Bagcilar Sports Complex in Istanbul, Turkey. Romania’s 2018 European champion Mihai Radu MIHUT (ROU) won the 63kg U23 European title with a 5-3 win over Alexandru BICIU (MDA). Mihut’s first-period passivity point and two gut wrenches proved to be the difference in fighting off Biciu for the gold medal. Rajbek BISULTANOV (DEN) captured the 77kg gold medal with a dominating 7-1 performance against Russia’s Ismail SAIDKHASANOV. Bisultanov’s seven-point first period was kicked off with a four-point throw near the out of bounds line, giving the wrestler from Denmark the 4-0 lead. He followed that with a passivity point and correct throw, ultimately taking the win, 7-1. 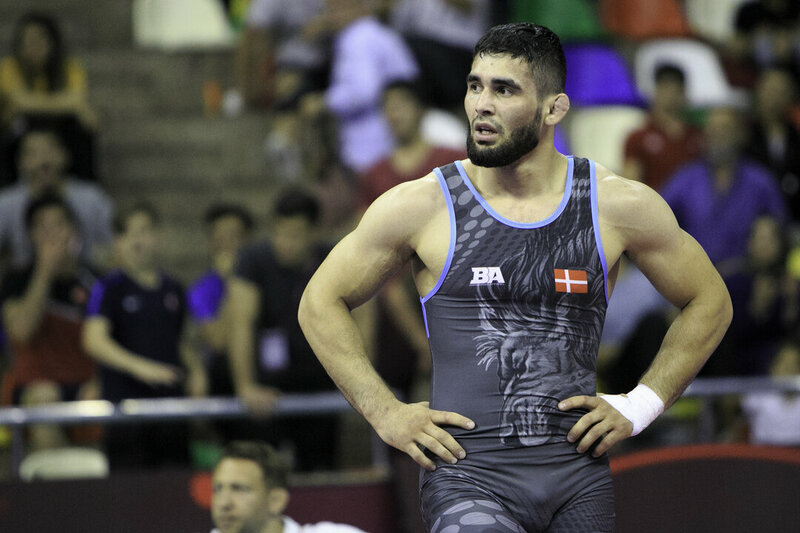 In the 87k gold-medal bout, Islam ABBASOV (AZE) scored his takedown and gut wrench in the first period and cruised to the 4-1 victory over Ivan HUKLEK (CRO).